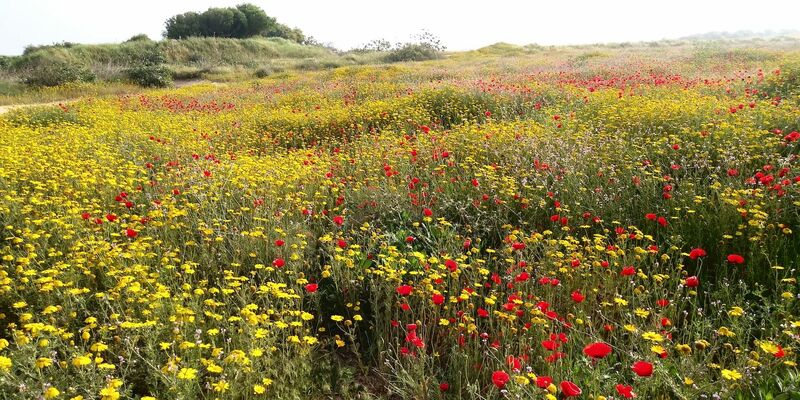 If all those people hiking the Camino, the Pacific Crest Trail, and the West Highland Way have inspired you to pack a bag and take a long-distance walk, know that there is a lesser-known path in the Middle East that is just as rewarding and much less crowded. The Israel National Trail is a 683-mile hiking trail that crosses Israel between the southern and northern borders. It is the perfect endeavor for those who are looking for something challenging, not just physically but philosophically, with a dab of cultural exposure and political reality check, as well as jaw-dropping landscapes. 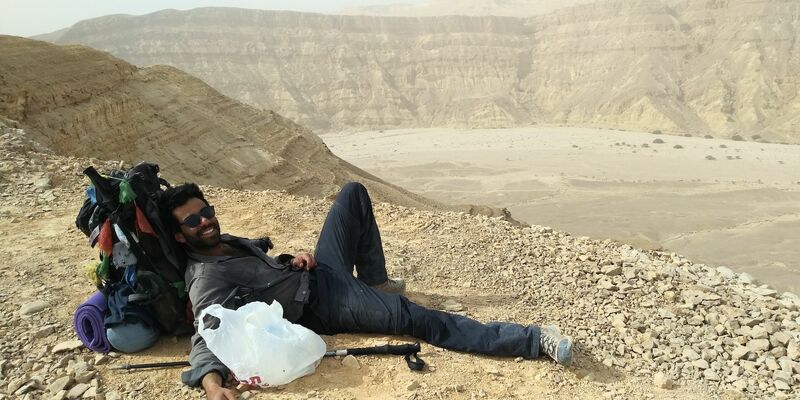 Here is why you need to trek the Israel National Trail. Israel is small but incredibly diverse, and you’ll see all of it. The fact that Israel is a small country is a good thing since you’re not only going to walk across it, but you’ll be on a meandering path that turns the roughly 283 miles north to south into 683, not including the irresistible side-trips. Here’s the lay of the land. The remote and physically demanding Negev desert is often considered the most rewarding, with its canyons and craters, moonscapes and oases. 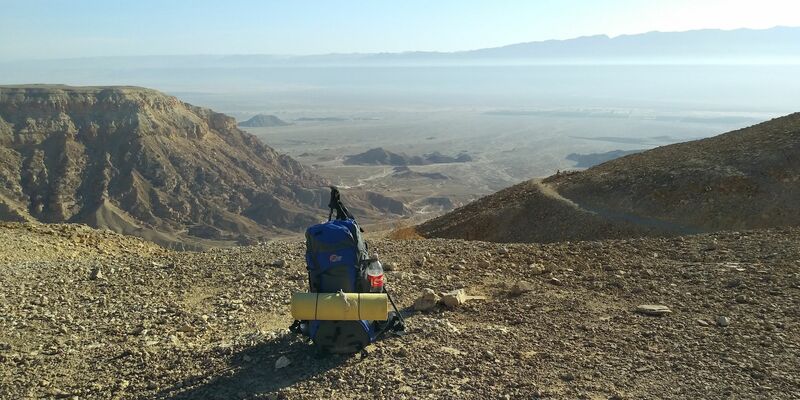 It has its logistical challenges, but they are relatively easily overcome — water and supplies can be cached by you or by an operator (we recommend Yonatan from Shelter Hostel in Eilat) or simply hauled on your back and rationed more carefully. 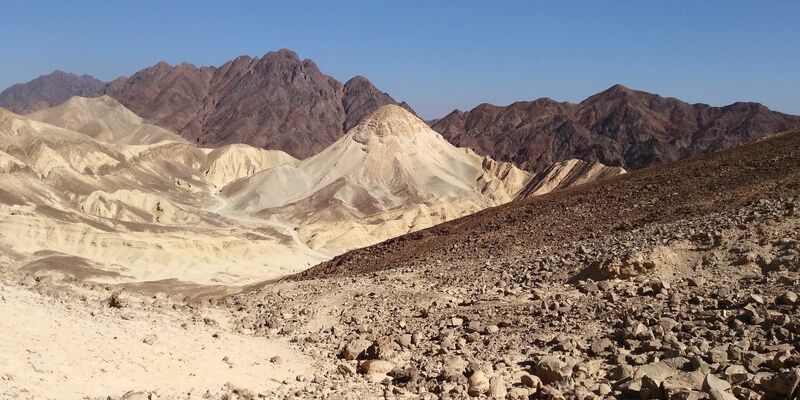 For a respite, there is fairly frequent access to communities not far off the trail and on trail diversions like Timna Park, with its unlikely pond and luxurious restaurant, or the sleepy town of Mitzpe Ramon perched on an amazing crater. Rustic camping conditions may also be augmented with a romantic night in a traditional Bedouin tent, and be sure to revive your parched body by cliff jumping at the Ein Akev oasis. There is nothing quite like sleeping out under the stars in the desert or in a tent if you don’t mind the weight — or worry about snakes and scorpions. In contrast to the desert south, the trail through central Israel blends rolling forests, gorgeous coastline, and the steep rocky mountains around Jerusalem with their ancient terraces, springs, and scenes that can only be described as biblical. Relive the drama of the Burma Road, the impossible bypass that broke the siege of Jerusalem during the Independence War, and stroll through the forest of six million trees, planted in memory of the Holocaust victims. Ancient ruins and historic sites are everywhere — far too many to excavate and develop them all, which means you find yourself having breaks or taking shelter in some very ancient high-class settings. Though you will be winding your way through the most populated area of the country, the trail somehow manages to keep the culture shock to a minimum so that even the trail into Tel Aviv, with its tunnels of greenery, feels surprisingly remote. 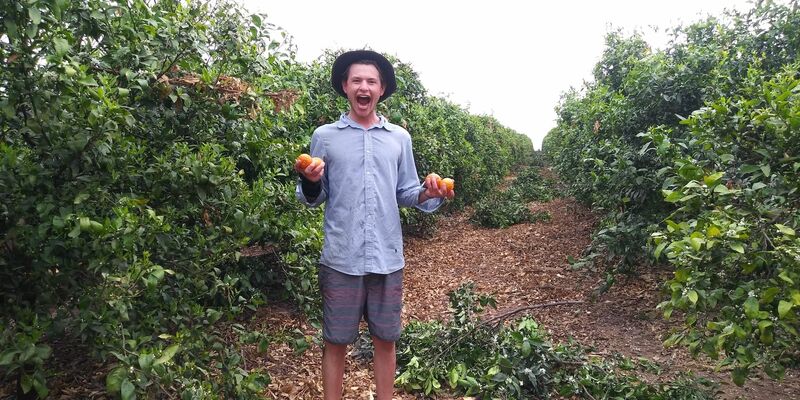 The north of Israel is an agricultural wonder where traditional Jaffa oranges, grapes, and olives grow next to the more modern climate-adapted avocados, bananas, and mangoes. The fields are interspersed with artsy communities; the cultural variety of Druze, Bedouin, and Arab villages; the classic waters of the River Jordan and Sea of Galilee; and everywhere, historic and religious sites that are guaranteed to be of some interest to just about everyone. Imagine the entertainment of the Roman/Muslim/Crusader theater in Caesarea or where Jesus was baptized by John in the River Jordan, but don’t miss the modern-day miracle of generosity at the Angel Shelter Khan Yotam just outside the artist’s colony of Ein Hod. There are also many caves worth exploring, so keep your eyes peeled. I found myself laying out my sleeping bag deep in a huge beautiful bell cave barely noticeable on the side of the trail. Even while the darkness hiding who-knows-what in the depths, combined with the undecipherable sounds, were intimidating, I couldn’t resist the beauty and welcome of nature’s shelter embracing me and slept like a baby. Try it. You’ll truly get to know the country through its people. On a long journey like this one, social interaction is very important, especially if you’re tackling it on your own, and the people is where the INT really shines. Since I took this trip in early 2018, I tell everyone that if they ever lose faith in humanity, go and hike the Israel National Trail. It will restore you. Israel is a country largely populated by the returning diaspora of Jews from all of over the world, so Israelis themselves are as diverse as your fellow hikers. That said, there is a distinctly Israeli identity, and it can take a little bit of getting used to. The people there are very straightforward, but their honesty and lack of pretense are liberating and make for deeper or more meaningful conversations. If you have come to Israel with preconceived ideas related to the Israeli/Palestinian conflict, or any of the other political issues of the Middle East, you’ll find it surprisingly easy to find people to discuss those ideas with. Take advantage of the rare opportunity for insight into one of the world’s oldest, newest, most hated, often envied, and undeniably enduring cultures of our times. On the INT, the Angels are accessed through Israel National trail app — the same app that leads you back to the trail if you miss a marker, warns you of the day’s challenges, reminds you where water is available and offers fellow hikers’ comments, among other things. Angels are listed by location, and like so many things in Israel, they’re delightfully practical: “shower, laundry, food, two beds.” Some will ask for prior notice, but most are flexible. 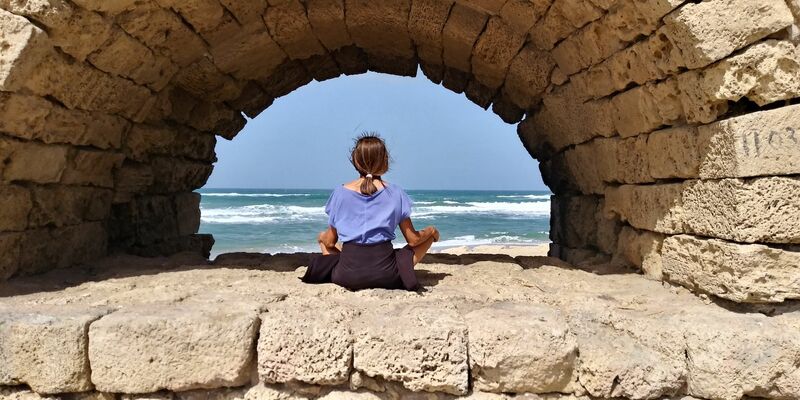 Whether you are hosted by the shin-shinim (young adults doing the popular, pre-army volunteer year of service), on a kibbutz, by fellow outdoor enthusiasts in a small yeshuv (community), or a friendly family in Tel Aviv, you’ll meet hosts with histories from around the world, sharing the typical Israeli curiosity and strong belief that everyone should go to bed clean and fed. And of course, hummus, pita, and black coffee. On the trail, you’ll meet hikers from all corners, so you’ll be in good company when you want it. The trail is remote and still undiscovered enough to offer plenty of solitude and encourage generosity and solidarity amongst both thru-hikers and day-trippers. Israel has a very strong food culture, and casual encounters will often involve sharing — a bonus for the ever-starving trekker. The side trips are mind-blowing. The INT stays firmly in undisputed Israeli territory, avoiding the Occupied West Bank, which means it’s the perfect area for some great side trips. It also skirts the capital, Jerusalem, which is a trip on its own. Jerusalem is the center of the monotheistic world and a crazy mixture of ancient stone architecture lining traditional markets and modern high-rises housing chic shopping malls. It is also a cultural, political, and culinary hub not to be missed. Visit the last remaining wall of the ancient Jewish temple, the Muslim mosque built on top of it, and the crucifixion site of Jesus, all in one afternoon. And if that doesn’t fill your divine bucket, Bethlehem is just around the corner. The Dead Sea, the lowest place on Earth and a geographical wonder, is truly unique but sadly disappearing at an alarming rate. Enjoy an effortless float on water so dense with minerals it feels oily, your body so buoyant you could paddle to Jordan with no fear of drowning (not recommended). Just beware of splashes; while the salty water is great for your skin, it will burn your eyes, lips, etc. The Dead Sea Mud is more manageable for a facial; you can find it at some beaches and packaged in stores all around the country. From the Dead Sea it’s a short hop to Masada, one of Herod’s old fortresses and the site of a last-ditch refuge for a group of Jewish extremists escaping conquering Romans in the first century. It’s a beautiful desert scene with a rewarding hike (or cable car if you are needing a break) and a great story. Depending on your start date and fitness level you can choose to go in either direction, but note that north to south is easier if you start in late summer/fall, and south to north should be started anytime between November and February (the 250-mile Negev Desert portion is coolest between October and March, with awareness of flash flood possibilities in canyons during rainy periods). Thanks to Israel’s relatively dry climate and easy access to civilization, the equipment list is pretty basic. A comfortable, light backpack; good shoes (I wore sneakers); down sleeping bag (for cold desert nights); foamie (the blow-up mats hate those sharp desert rocks); cooking kit; sunscreen; and a hat are the base. The tap water is good, so buying water is unnecessary — just refill what you have. A wider-mouth insulated stainless cup not only extends coffee break but is good for water-rationing and doubles as an efficient slow-cooker. Your feet will thank you if you carry a pair of flip-flops for the evenings. But most of all — if you haven’t been converted, swallow your ego and take walking poles. They’ll save your knees, transfer some of the load to your arms, but most of all, free you up to enjoy the view. The trail markers are made of three painted lines: orange for the desert south, blue for the central coast, and white for the Mount Hermon snow. They are staggered to show direction and are mostly accurate. Take your smartphone with you and use it. Israel National Trail app makes life very easy. The INT is part of a labyrinth of trails, but your GPS plotting on the app map will save you from missing those unlikely turnoffs. Phone plans are cheap in Israel, and reception is good almost everywhere, though in the desert you may have to climb (yet another) hill. For pre-trip research, Tapatalk is an online forum for all of your questions and a great place to meet fellow hikers. I also recommend reading The Israel National Trail by Jacob Saar. It’s easily available online or in bookstores, as are detailed topographical maps.